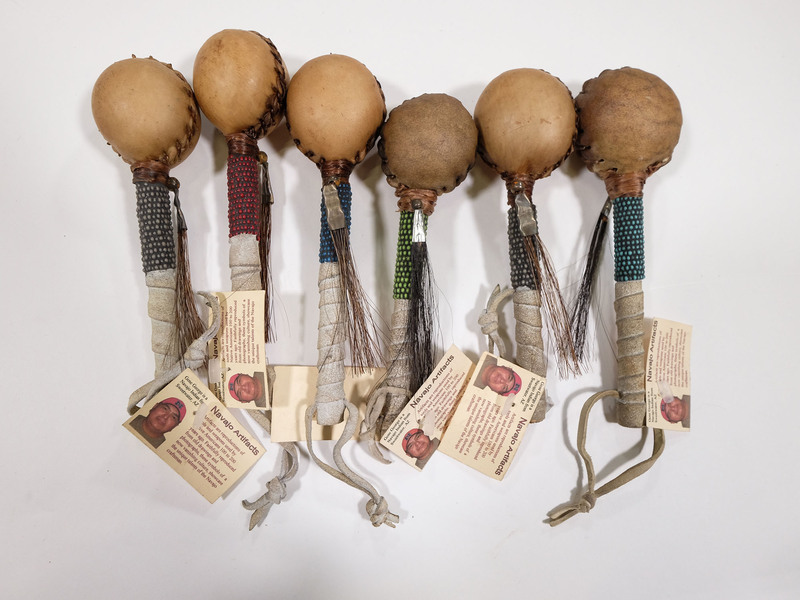 The Navajo Ball, Steer, Turtle and Bear rattles measure 6.25" in length. 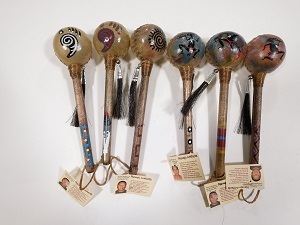 They are hand painted with bead-wrapped handles. They are Native Made by artisans in New Mexico. Each rattle weighs approximately 0.8 oz. The Plain, Petroglyph and Drum styles are made by Native artisans from New Mexico or Arizona. They come with a card and description and photo of the artist. 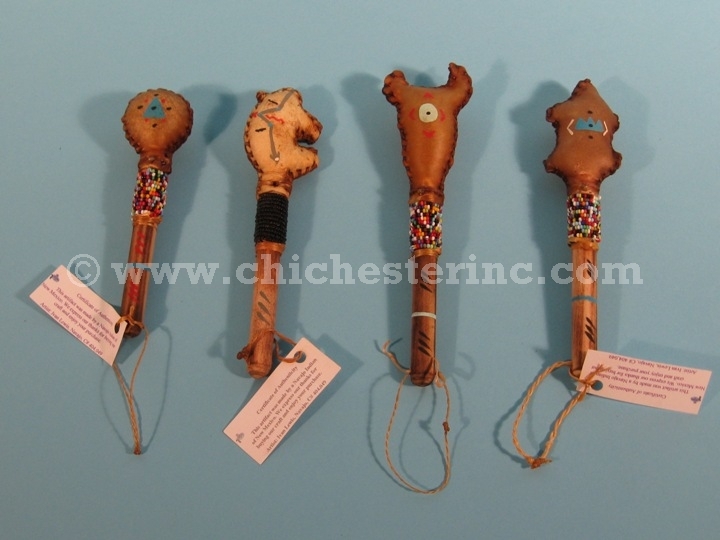 The Plain style of rattles are made with cow rawhide, and are decorated with seed beads, horse hair and sinew. They are mounted on wooden dowels wrapped in antiqued pigskin. They measure 2” x 2” x 1.5” in size, with a 6" long by 0.5" wide handle. They weigh approximately 25 grams. The Petroglyph style of rattles are made with cow rawhide, and are mounted on wooden dowels wrapped in antiqued pigskin. They are decorated with horse hair and sinew, and have different painted designs. We will send assorted designs when you order this item. These rattles measure 2.25” x 2.25” x 1.5” in size, with an 8" long by 0.5" wide handle. They weigh about 25 grams. 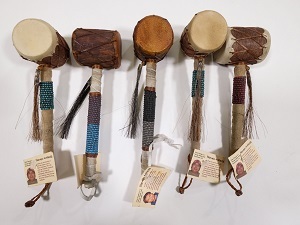 The Drum style of rattles are made with goat rawhide and sinew, and decorated with seed beads and horse hair. They are mounted on wooden dowels wrapped in antiqued pigskin, and measure 2" x 1.75" x 1.5" in size, with a 6.75" long by 0.5" wide handle. They weigh approximately 55 grams. Genus and species of pig: Sus scrofa. Ranch. Genus and species of horse: Equus caballus. Ranch.